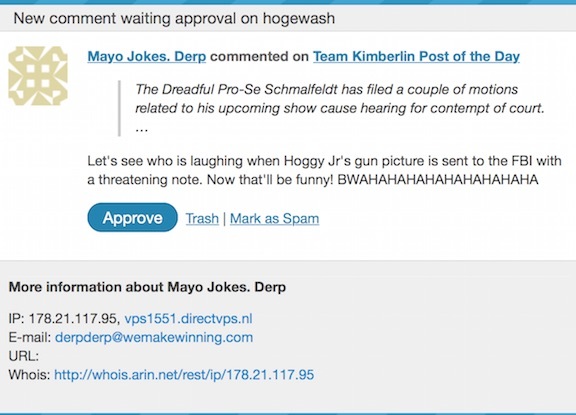 One of the forms of harassment which Team Kimberlin as tried to use against me has been sending bogus and often obscene comments to this blog. Most of them have never seen the light of day, but I’ve published a few. I posted the first batch as the TKPOTD five years ago today. This post is one of the most difficult post I’ve done in my two years of blogging. It’s about some of the stuff that I’ve received from Team Kimberlin that I’ve kept out of the public view. Beginning in the late summer of 2012, Hogewash! began receiving comments from obviously bogus commenters. I don’t mean spam. This site gets plenty of that, but the filtering software catches well over 99% of it. Many of these comments were abusive remarks addressed to me or members of my family. All were in some way tied to my blogging about Brett Kimberlin. After the peace order was granted against Bill Schmalfeldt, the rate such comments came in exploded. I’ve got about 300 logged in since mid June. Gentle Reader, I’ve pulled out a dozen of them to show you a sample of what I’ve been receiving. They are from the mild end of the scale. As offensive as some of these may seem, they are rather tame compared to many other comments. Gentle Reader, I don’t enjoy wasting pixels on such trash. 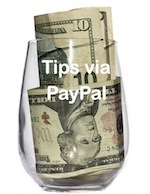 I hate giving Team Kimberlin increased exposure on a blog with 10X the reach of their combined effort. OTOH, I want you to understand that the crap that I’ve been dealing with from Bill Schmalfeldt on Twitter is just the tip of the iceberg. Preparing this post was like swimming in a sewer. I need a shower. I’ve received over 1500 such comments, but it’s been almost a year since the last anonymous comment came in. It took ’em five years and over 1500 comments, but it appears that they eventually learned that they had failed to intimidate me. 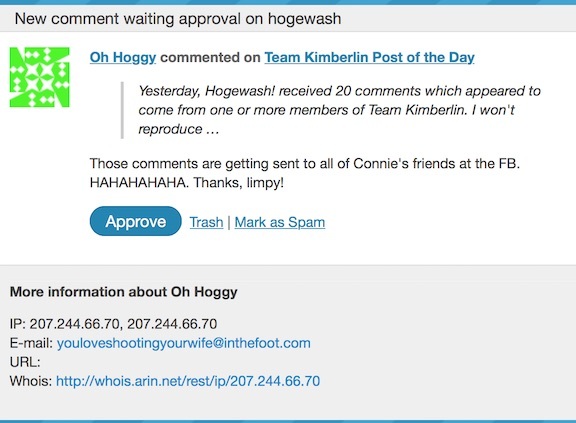 Yesterday, I wrote about the lame comments that Team Kimberlin have attempted to post to this blog. While some have been a source of comic relief in there childishness, some have been disgusting. The TKPOTD from three years ago dealt with some of those comments. Later that day three years ago, one of the Kimberbots decided to double down on stupid. I responded that he should Feel Free to Make a Bigger Fool of Yourself. Here’s one of the Team Kimberlin comments so far this afternoon. Go ahead. Post the stuff on Facebook. Mrs. Hoge’s friends all know her and will be certain that the she isn’t the source of any of your filth. While you’ll disgust some people, you won’t embarrass her. You’ll simply show yourself to be a creeptastic fool. You’re gonna need a good-sized bandage for you own foot. And so the mockery continues, but not as Team Kimberlin expected. 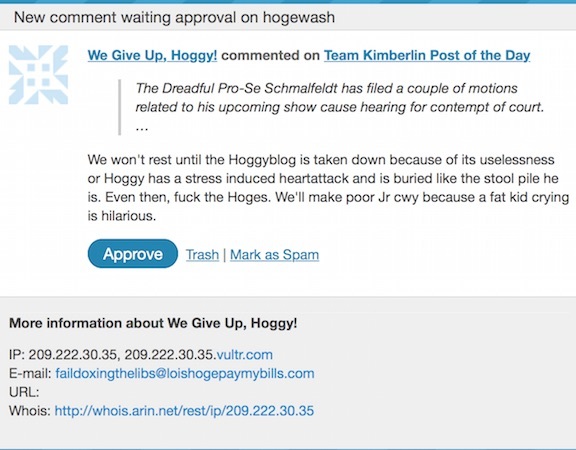 Another bit of the comic relief from The Saga of Team Kimberlin has been the lame comments they try to post here at Hogewash!. Three years ago today, I received these comments that wound up being published in a post titled While Hoggy Slept. I took a nap this afternoon. When I woke up, I found these among the comments waiting moderation. I’m beginning to think that someone on Team Kimberlin doesn’t like me. You know, I hope that someday one of the Kimberbots will do something as was threatened in the first comment, and the FBI will take it seriously—not as a valid complaint but as a false statement in violation of 18 U.S.C. 1001. That’s the law Scooter Libby was charged under.